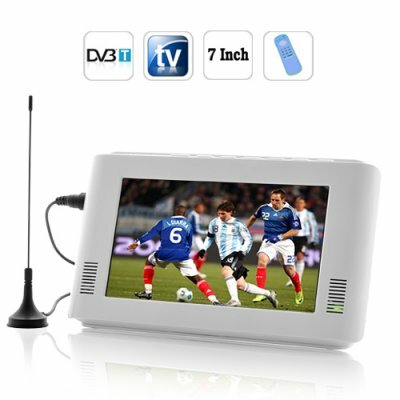 Successfully Added 7 Inch Portable DVB-T Digital TV Player + MP3/MP4 Player to your Shopping Cart. Portable DVB-T Digital TV player with 7 inch LCD screen, TV recording functionality, remote control, and built in MP3/MP4 player. Watch television on-the-go like never before! If you love television, you can finally watch it no matter where you are! The E141 DVB-T Digital TV player lets you receive beautiful, crystal-clear DVB-T digital TV signals anywhere you go: on the bus, in the car, at the beach, indoors at work, at the in-laws house, and in the bathroom. The CVUG-E141 comes with a full-function remote control that lets you control every aspect of the DVB-T Digital TV Player. Users can also record everything to an external 8GB SD card and watch it later directly through the portable DVB-T digital TV or transfer the file and watch it on their computer/laptop. You can even play your favorite MP3 music or AVI video files from this device, making this the ultimate portable entertainment device! The CVUG-E141 is in stock now, so order today and we'll ship it out tomorrow! Buy one for yourself or your friends and start enjoying TV everywhere you go. Even better, take advantage of our bulk discount pricing and 12 month warranty to outsell your competitors on eBay and Amazon with the lowest price on the net! Does this product come with an SD card? No, however, you do not need an SD card to enjoy watching DVB-T television. The SD card is only if you wish to record TV shows or put MP3 or AVI files on it.